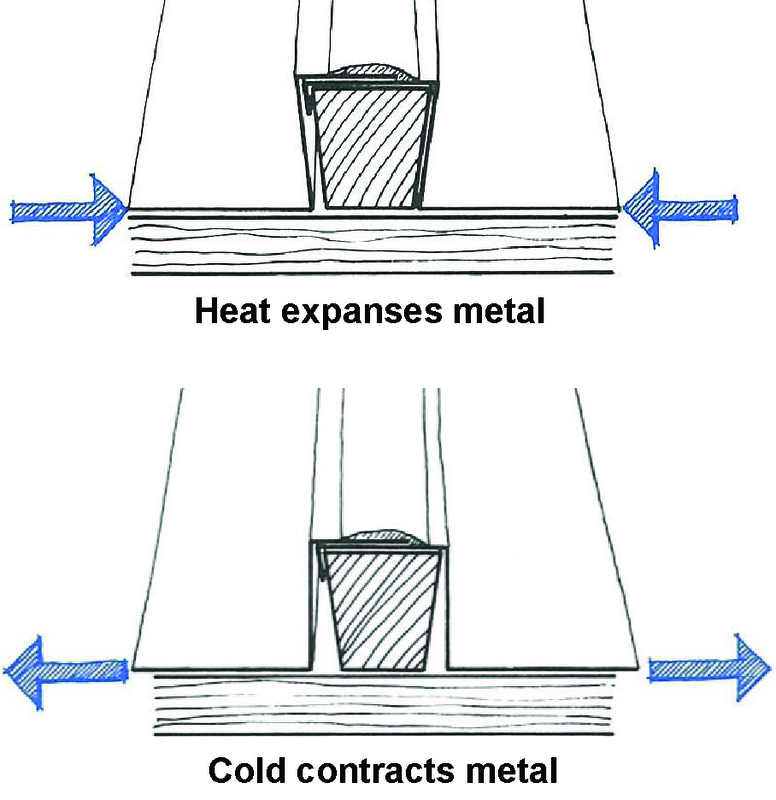 What about the oil canning of metal panels ? What are the handling and stockage procedures for metal panels ? To receive the complete PDF document with figures, contact us. Both painted and unpainted products should be kept dry. Abrasion, which appears as scuff marks, can result when panels flex during loading or unloading. 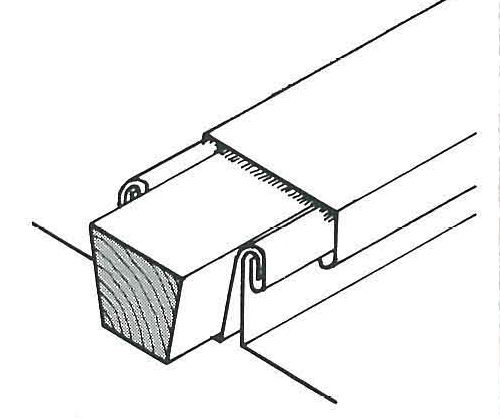 Long bundles should be lifted with equipment that supports most of the panel length (see Receiving section). Bundles should be rigidly packaged with crosswise and lengthwise blocking. Truck loading should insure that panel bundles are protected from contact with other items, such as structural components. Carriers must be aware of safety requirements and obey all local, state and federal laws, including proper securing of loads. When lifting bundles with a forklift, the forks must be a minimum of five feet apart. Panel scuffing, buckling, corrosion or wetness that can lead to corrosion during job site storage. Bundles of panels are typically unloaded either by forklift or crane. In either case, panels in bundles should be lifted at their center of gravity, and the bundle should be supported along the length. Crates should never be turned over on their sides for lifting. Never ride on the crates that are being transported. Forks must be spread a minimum of five feet. 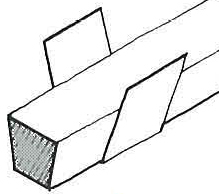 The allowable overhang depends on the strength of the panels in the bundle. When lifting beneath the load, one forklift can be used. Longer bundles will require additional forklifts so no more than the specified length overhangs at either side of the forks. Spreader bar must be secured to forklift. A forklift can also be used to raise bundles longer than the specified maximum when they are suspended from a spreader bar. Forks should not extend beneath the load so as to damage material in front of the load when the bundle is placed. Drive slowly over uneven terrain to prevent panel buckling. Do not transport open bundles. When lifting bundles with a crane, nylon straps at least 2 inches wide should be used. Never use wire rope slings or chains. Whenever possible, place the nylon straps beside the wooden frames that surround the bundle. The nylon straps must not damage the panels. Use spreader planks when required beneath and above the bundle to protect the panels. The plank at the top of the bundle is especially important if a choker is used. Lift points must be no farther apart than either the value specified in Table 1 or the length of each suspending cable, whichever is less. A spreader bar should be used if the distance between the outer pick points is greater than the length of the cable. Use a spreader bar light enough so that the crane can lift the combined weight of the bundle and the spreader bar. Several slings can be supported by a single spreader bar. Panel bundles must be inspected when received at the job site. Examine for mechanical damage, rips and tears in the packaging and the presence of water. Rips and tears in the paper wrapping must be repaired using water-resistant tape. If water is present in bundles of tightly stacked panels, the panels must be separated, wiped dry with a clean cloth and stacked with space between the panels so air can circulate and finish the drying process. Wet panels should also be inspected for evidence of blisters or corrosion. If found, these conditions should be noted on the receiving documents and reported to the panel supplier. Panel scuffing, buckling, bending, corrosion or wetness that can lead to corrosion during job site storage. The best way to reduce the possibility of damage during storage is to minimize the storage time. Other steps are designed to reduce the intrusion of water from rain, snow or condensation. A primary objective is to keep both painted and unpainted panels dry. Storage under roof is always preferable. Store away from materials that may contaminate the surface (such as diesel oil, paint, grease) and away from site traffic. Store in a level area away from construction activities to minimize the number of movements. Bundles stored on the ground must be placed on a plastic ground cover to minimize condensation of water from the ground on the panels. 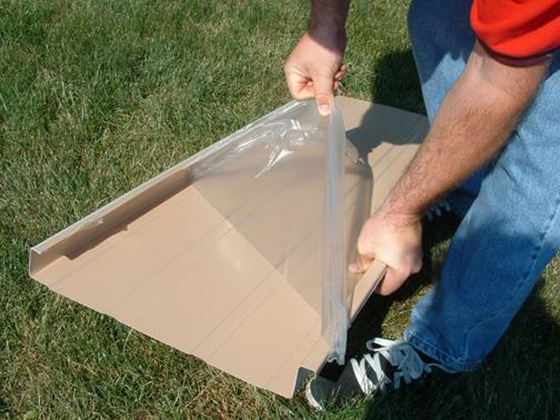 Bundles must be raised several inches above the plastic ground sheet to avoid contact with puddles and to allow for air circulation. Wet or treated lumber must not come in contact with the bundles. The panels must be stored at an angle to promote drainage, taking care that the bundle is properly supported at each crosswise runner along its length. The bundle must be completely sheltered with a loose-fitting, waterproof tarp to protect the bundle from rain or snow while allowing for air circulation and drying of condensed water. The tarp also shades the bundle from direct sunlight, which helps to moderate temperature extremes and UV damage to protective masking. Though it may seem like a good idea to wrap bundles in tightly sealed plastic wrap, this practice should be avoided because moisture can be trapped inside. If bundles of nested panels become wet, sheets should be separated, wiped with a clean cloth without delay and then placed so that air circulation completes the drying process. This is true for both painted and unpainted panels. When storing building panels, keep in mind that you are preserving both the integrity of the panels and the ability of the protective masking to release easily and with no residue after installation. Coatings on unpainted materials may deteriorate, resulting in non-uniform appearance that cannot be reversed. Prolonged exposure of bundled, prepainted panels to wet conditions can cause paint blistering or substrate corrosion. Adhesion of strippable film will increase over time and can cause removal problems. If panels are exposed to extreme heat or extensive solar radiation during storage or after installation, the strippable film may be very difficult to remove, and a residue may be left behind. In extreme cases, the film may be impossible to remove. Individual panels should be lifted vertically by the seam. Do not pick up panels by the ends. If the panel is over 10 feet long, lift it with two or more people on one side to prevent buckling. Unpainted panels should be handled and installed using clean, dry gloves. Remove strippable film as soon after installation as possible. Caution! The masking is a translucent plastic film that may not be readily apparent. Be sure that it is removed from all panels and accessories. Exercise extreme caution when handling panels on windy days. Panels can catch the wind and knock a worker down, even on the ground. Panels may buckle. Unpainted panels will show fingerprints if gloves are not worn. Masking may be difficult or impossible to remove. Workers may be injured. The preferred method for handling bundles of flat sheets is with the use of a below-the-hook lifting device. The material is supported uniformly along the long edges of load. Nylon slings can also be used so long as the material is adequately protected where the slings contact the load. The success of this point-loading method is dependent on the soundness of the runners that support the load. Although less desirable, forklifts must be used sometimes because an overhead crane is not available or material must be moved from one crane bay to another. A forklift with long forks that support at least 66% of the skid length can be used to move material so long as the driver is careful to support the material uniformly along the length and width of the forks and avoid damaging material on the narrow edge when approaching the load. Handling long skids of material with short forks is more problematic and should be avoided. Unfortunately, pushing or pulling long skids is common. Of the two methods, pushing the skid is preferable, but the skid and the material are often damaged. Relatively short skids less than 12 feet long can be safely transported by approaching the load from the long side, so long as the forks are long enough to support all of the lengthwise runners. Forks must be spread so the load is stable and supported evenly. For example, for a 12-foot long skid, the forks would be spread to 4 feet wide, with a 4-foot overhang on each side. To lift a 10-foot long skid, the forks would be spread to 4 feet wide with a 3-foot overhang on each side. When skids of flat sheets are being readied for shipment, the hold-down straps should be placed in a vertical line with the cross-wise runners as shown in Figure A6 to prevent damaging the edges of the sheets when the straps are tightened. What makes 3R Tiles distinctive in architectural creativity ? Aside from the quality of the material and the manufacturing factory process, Tuiles 3R wanted to offer its customers the ability to customize the architecture of any building by combining multiple shapes, patterns of poses and colours (see Special projects section). 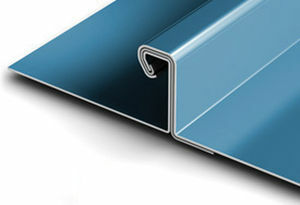 In addition to reproduce with fidelity the metal roofs of old style, Tuiles 3R products allow unique contemporary design creations, without compromising the technical requirements of strength and sealing. It is thus possible to blend several models of tiles on a same building by varying shades of colors, geometric shapes, dimensions of identical parts as well as the installation guidelines. Exterior wall (wall covering, siding, attic) tiles may very well harmonize with other materials such as wood, brick, stone and glass. These wall tiles can also be installed on walls or interior architectural structures to create a bold and unique design. How PVDF Kynar 500® finish provides superior performance on metal roof and siding ? Tuiles 3R offers you products in steel and aluminum painted with PVDF that provide superior durability and optimal resistance to cleaning of graffiti on sidings. KYNAR 500® and HYLAR 5000® (PVDF) surface finishing products are currently the best treatment products for the siding and metal roof in aluminium and steel. All products from Atas International, Inc., and tile shapes of 3R Tiles are painted with PVDF. Comparative tests with other finishing products have shown that the PVDF (KYNAR 500® / HYLAR® 5000) achieve better results at the level of resistance to UV rays, abrasion, fading, chemicals, solvents. This treatment also allows to clean stains and graffiti without leaving visible traces or damage the coating. KYNAR 500® and HYLAR 5000® are compounds of polyvinylidene fluoride (PVDF). PVDF is also used and tested in multiple industrial applications where the product is exposed to extreme variations in temperature as well as multiple chemical corrosive elements. The comparative strength of the surface treatment of PVDF Kynar 500® was assessed in laboratory tests and exterior exposition to climatic conditions.. Among the results, PVDF has much better resisted to climate exposition and with testing solvent cleaning compared to Acrylic and Silicone-Polyester based products. 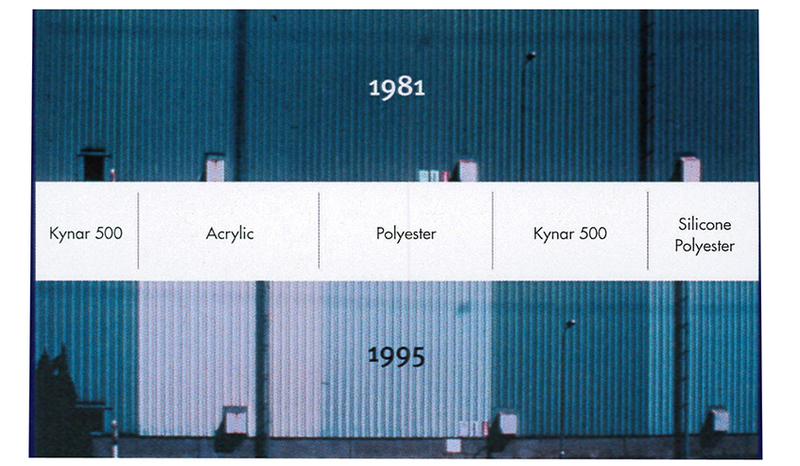 Photo above: Color changing of various paint finishes when exposed to climate condition. 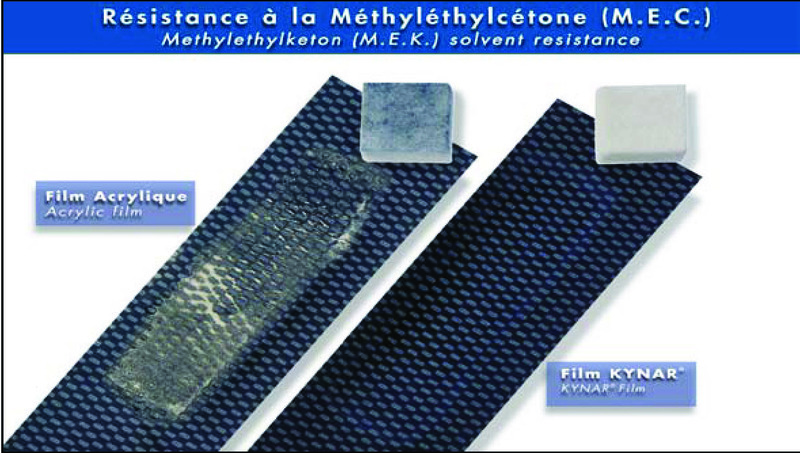 Photo above: Friction resistance test using solvent cleaner products. Organic coatings meet requirements of AAMA 2605 when applied to aluminum. What return on investments could you expect with a metal roofing ? What features heritage roofing tiles (Standing Seam, Canadian style, Wood casing tile) ? What is the advantage of patented Dutch Seam fastener ? What makes metal roof far beyond asphalt shingle ? How plastic film improves metal tile and panel protection ? What does 3R Tiles “in relief effect” siding tile means ? What is the distinctive choice 3R Tiles offers in perforated panels ? 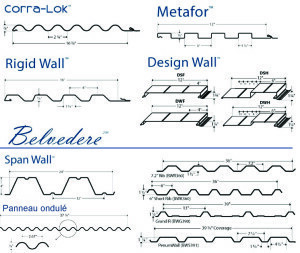 Tuiles 3R offers you the widest choice of metal panels perforated on the market. Now, you are no longer limited in selection of products perforated for your architectural projects. The panels perforated of Atas International are grade aluminum. 032, 040 and .050. They are available in ten of configurations and six patterns of standard perforations (transparency of 23% to 51%). Perforation tailor-made schemes can also be manufactured. Factory aluminum foil is first perforated, then formed and finally processed and painted with PVDF KYNAR 500® or HYLAR 5000®. The color covers the inside of the walls of the holes. The back of the panel is treated and painted in primer or the same color as the front, on request. 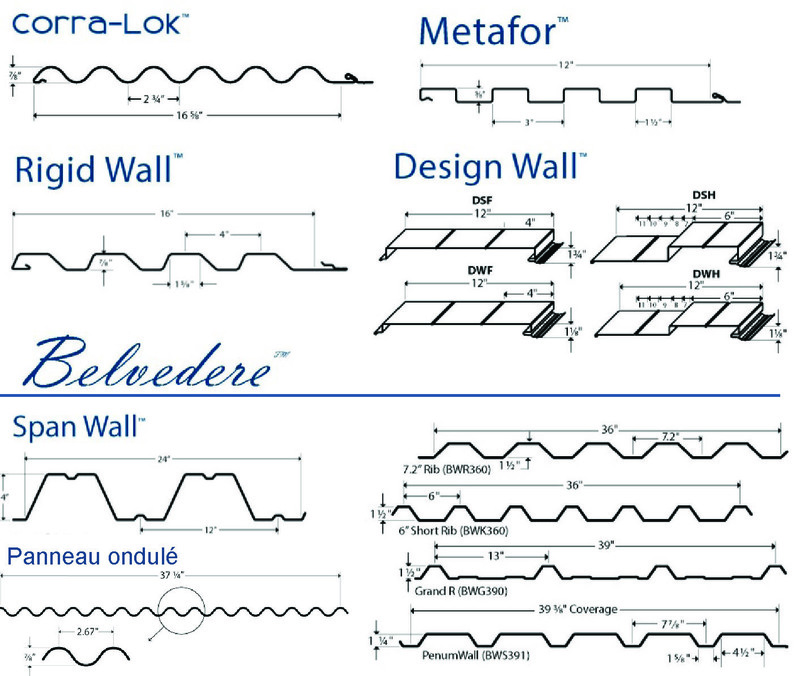 All these configurations of panels are available in different patterns of holes (see Metal siding tiles section).